Over the centuries, the Scottish clans have written their history in blood and stone-the blood they spilt and the stone they used to build their fortresses and family seats. The power of the clans was destroyed in a few hours at Culloden, on April 16, 1746, and their lands and houses were largely dispersed during the Scottish diaspora of the 18th and 19th centuries. But scratch the surface of almost any historic property for sale in Scotland, and you will find links to a romantic heritage based on land, lineage and fierce tribal loyalty. It’s a heritage that resonates well with daredevil marine entrepreneur Ric Wharton, who, in 1981, salvaged £50 million of Russian gold from the wartime wreck of HMS Edinburgh in a hazardous diving project that was partly funded by a pledge on his Scottish home, Midmar Castle at Inverurie, Aberdeenshire. Mr Wharton and his wife had bought the Category A-listed, 16th-century castle as a virtual wreck in 1977, and spent years restoring and refurbishing it, before handing it over to their children. Mr Wharton now lives in Guernsey, and his children, who are mostly based overseas, are seeking a new owner for the castle, at a guide price of £3.2 million through Knight Frank (0131-222 9600). castle is based around three towers-one square and two circular. In the 18th century, the Grant family added the raised terrace entrance and the two plain roofed wings of the north courtyard. 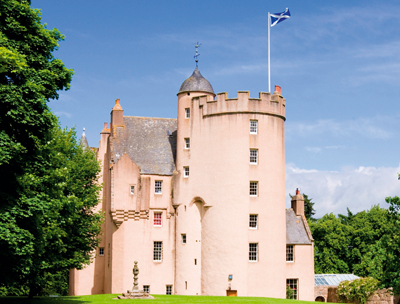 Set in 185 acres of gardens, parkland and productive farmland to the north of the Hill of Fare, three miles west of Echt, Midmar Castle (pictured) overlooks the battlefield where another Gordon, the 5th Earl of Huntly, lost his life in a failed uprising against Mary, Queen of Scots. The castle has five reception rooms, 10 bedrooms, three bathrooms, a two-bedroom farmhouse and period outbuildings. As the seat of a Scottish feudal barony, ownership brings with it the title of Baron of Midmar. Also for sale through Knight Frank, at a guide price of £7m, is the historic, 3,173-acre Leys Castle estate near Inverness, with its Category A-listed, Tudor Gothic castle built by Samuel Beazley for Col John Baillie in 1833. It has spectacular views over the city, the Moray Firth, the Black Isle and beyond. The original Leys estate was owned from 1712 to 1885 by the Baillie family, important local landowners who moved in the upper echelons of Highland society. In 1926, it was bought by Sir Francis Walker, who acquired more land from the Baillies of nearby Dochfour, including the farms of Balmore, Balvonie, Newton, Braeton and the Black Wood-all part of the estate now being sold by his descendants. Knight Frank and Savills (0131-247 3700) are joint agents in the sale, at £2m, of the romantic Carie estate on the southern shore of Loch Rannoch, in the heart of Highland Perth-shire. Carie is the ancient seat of Clan Robertson of Struan, whose chiefs lived at Carie House and owned most of the land in these parts. After Culloden, the Robertsons refused to ‘clear’ their estates of their clansmen in favour of the more profitable sheep, an honourable but financially ruinous policy, which led to the eventual loss of the entire clan lands by the early 20th century. The old Carie House, which stood some yards to the east of the present main house, was neglected by the hated Forfeited Estates Commissioners, who had seized the Robertson lands, and it burned down in the early 1900s. All that remained were three estate cottages and the drawing room of the main house, which was used as a crofter’s shed. The present owners’ predecessors, who bought the estate from the Forestry Commission in the late 20th century, restored the drawing room and joined it to two of the cottages to create the foundations of the new Carie House. They also added the bow front and the library wing, and inserted a small conservatory entrance hall between Carie House and Morag’s Cottage so that both houses can be either connected or used separately. The main house has three reception rooms, a kitchen, a conservatory, three bedrooms, three bathrooms and an attic; pretty Morag’s Cottage has two reception rooms, two double bedrooms and a bathroom. All the buildings at Carie, including the two-bedroom Factor’s House, were extensively restored five years ago. Carie House stands in 58 acres of landscapedlawns, wetlands and woodlands, against the backdrop of Loch Rannoch to the north, the Carie Burn to the east, and the Black Wood of Rannoch to the south. The cottages produce a healthy income from holiday lets of some £40,000 a year. The Munros of Foulis have been living on the shores of Cromarty Firth for more than 500 years. Andrew Munro, fifth son of Robert Mor Munro, was the first of the Munros of Lem-lair, at Dingwall, near Inverness, receiving the estate in the early 1600s as reward for ‘services rendered’. In the mid-1800s, John Dearg Munro, a colourful character who made his fortune in the illicit whisky trade, bought the estate and, in 1876, built Lemlair House, a splendid Victorian mansion, probably designed by W. C. Joass, who laid out the walled garden a year later. Now thoroughly modernised and supremely comfortable, Lemlair House is for sale with 5.34 acres of colourful gardens and grounds, at a guide price of £1.2m through Strutt & Parker (0131-226 2500). The house, which has panoramic views across the Cromarty Firth, has three main reception rooms, nine bedrooms and four bath/shower rooms. The same agents quote a guide price of £1.65m for Kirkland at Tynron near Thornhill, in Dumfriesshire’s picturesque Shinnel Water valley, an impeccably refurbished Georgian house built in 1785 by the Kennedy family, Earls of Cassilis and later Marquesses of Ailsa, whose seat is Culzean Castle on the Ayrshire coast. A Scottish clan with an Irish surname, the Clan Kennedy supported Robert I of Scotland in the late-13th/early-14th-century Wars of Scottish Independence and were duly rewarded. The 1st Earl of Cassilis, the clan chieftain, was killed fighting the English at the Battle of Flodden Field in 1513, but there are few signs of strife at tranquil Kirkland, known locally as the sunniest house in the valley. Extended in the late-Georgian period with the notable addition of the east wing incorporating the magnificent drawing room, elegant Kirkland has four main reception rooms, a large dining kitchen, a billiard room, nine bedrooms, six bathrooms and a lower-ground-floor flat. A courtyard of stone outbuildings, built in 1821, has potential for conversion to residential or office use. Historic Killochan Castle at Girvan, Ayrshire, dates from 1324, when Robert the Bruce granted the lands of Killochan to the Cathcarts of Carleton in return for their armed support against the ‘auld enemy’; this later led to the death of Robert Cathcart of Killochan at Flodden Field. Built in 1338 as a four-storey tower house with impregnably thick walls, at one time, the fortress protected the entire Cathcart clan, who were besieged within the vaulted ground floor. In 1586, Jhone Cathcart added a wing and two extra floors to the original tower, and even a garrison of 120 soldiers sent to attack Killochan in 1678 was forced to concede defeat. During the 18th century, the outbuildings on the north side of the castle were demolished and replaced by a beautifully proportioned new wing, courtyard and gatehouse designed by Robert and James Adam, who were well known locally for their work at Culzean. Refurbished and modernised in the 1990s, Killochan Castle, set in 131 acres of beautiful gardens and woodlands overlooking Girvan Water, has six reception rooms, two bedroom suites, six further bedrooms, three bathrooms and a steward’s flat; the gatehouse has a drawing room, kitchen/dining room, three bedrooms and a bathroom. Knight Frank (0131-222 9600) quote a guide price of £2.6m for the entire property, including the contents.